Fusions are performed in patients with degenerative disk disease, spondylolysthesis, recurrent herniated disks, and spinal stenosis. In fusion of the lumbar spine two or more vertebral segments are joined together, eliminating movement in the joints. The procedure is performed with the hope of reducing pain caused by movement and associated compression of the nerve roots. 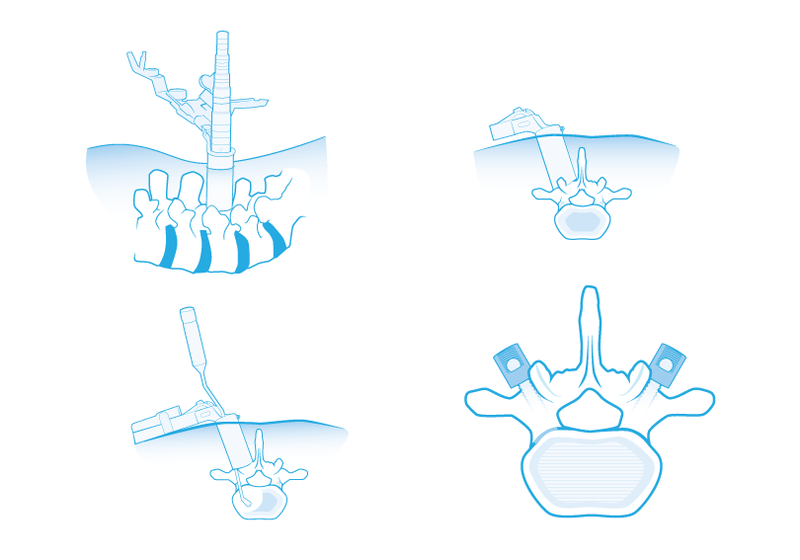 While there are numerous methods available to fuse the spine, in patients whose pathology allows it, the TLIF procedure can be minimally invasive. This means that there is a reduction in the amount of muscle and skin that is damaged during surgery and there is less blood loss and post operative pain. Potentially recovery time is quicker as well. As can be seen in the illustrations above, dilators are placed over one another in progressively larger sizes. A tube is then placed over the dilator and the dilator removed. Instruments are used inside the tube to remove disk material and make a space for the bone implant or fusion cage. The bone implant (Medtronic Boomerang shown here) or cage is inserted. Often, percutaneous pedicle screws are inserted to stabilize the joint while fusion occurs. Your site offered us with valuable information to work on. You've performed an impressive process and our entire community shall be thankful to you. it's new to me. Anyhow, I'm definitely happy I found it and I'll be book-marking and checking back often! attention? I mean Buffalo Neurosurgery Group is a little boring. what you've got to say. Just my opinion, it could make your blog a little livelier. that's both equally educative and entertaining, and without a doubt, you have hit the nail on the head. intelligently about. I am very happy that I found this in my hunt for something concerning this.